Grandstream introduced its next telephone system under the IP PBX category incorporating latest advanced telecommunication features that are well suited to the Small and medium businesses and the difference from the previous models lies in the additional security protection features and the unified communications of the enterprise grade made possible by the latest model- UCM 6104. Grandstream Dubai is an authorized reseller of Grandstream in Dubai. If you live in any area of UAE like Abu Dhabi, Ras Al Khaimah, Ajman, Sharjah, Al Ain or Umm Al Quwain, then you can easily get your desired Grandstream product by finding your nearest Grandstream Dubai store. The UCM series IP PBX of Grandstream offers the customers an extensive set of unified communication features that are easily manageable. Grandstream has launched two series that are UCM 6100 and UCM 6500 series. The UCM 6100 series is designed especially for the medium and small businesses and it has a full support for about 500 users and the UCM 6500 series suits perfectly well to the medium and small enterprises as it can support almost 2000 users. The UCM 6100 IP PBX series is comprised of 4 models. Grandstream UCM6104 IP PBX Dubai telephone system is one of them. Grandstream UCM 6104 is powered by a high quality and advanced hardware platform along with revolutionary applications and features. UCM 6104 offers you a simple and really convenient communication solution for combined data, security surveillance, fax, mobility applications and HD voice quality and all this is provided to you without any recurring cost or extra fees. Grandstream UCM 6104 IP PBX phone provides you with a high performance and industry leading features at a very affordable cost. The setup and installation procedure is very easy and can be done with the help of web browser user interface that can discover the IP endpoints automatically and also provides you with zero configuration provisioning. UCM 6104 is a reliable IP PBX phone and delivers small and medium sized businesses with high-level features and applications with unprecedented reliability. UCM 6104 is a complete package phone that is available to you in a very affordable and reasonable price. Grandstream UCM 6104 has a processor of 1 GHz ARM Cortex A8 with a large memory i.e. 512 MB DDR RAM, and it also incorporates a 4GB NAND Flash. There are four built-in PSTN trunk FXO ports and 2 FXS analog telephone ports that, in case of an outage of power provide you with a lifeline capability. It also features almost 50 SIP trunk accounts. Grandstream UCM 6104 incorporates built-in Power over Ethernet source, USB, and an SD card. Grandstream UCM 6104 has a support for 500 endpoint registrations of SIP protocol. It can handle 60 calls at a time. Moreover, there can be up to 32 attendees of the conference via UCM 6104. Grandstream UCM 6104 provides you with a very flexible dial plan. It also provides you with certain exciting features like site peering, call routing, call recording and a built- in NTP server. For the endpoints, there is a central control panel and a built- in LDAP contact directory. 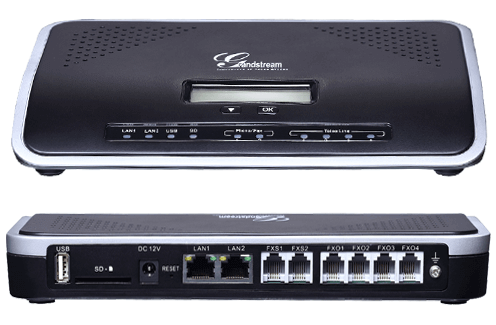 For easy deployment of Grandstream UCM 6104, it incorporates other endpoints, SIP cameras, video phones, an automatic provisioning and detection of IP phones, gateways, and ATAs. With Grandstream UCM 6104, you can have the best possible security protection via TLS, HTTPS with an accelerator for hardware encryption and SRTP. You can have multiple call queues that are configurable, the calls can be distributed automatically because of the automatic call distribution feature that can be handled by any agent. The communication system of your business acts as the backbone of your company. If you are not having a right PBX system in your company, then your internal communication will be badly affected. If you need to ensure that the incoming and outgoing calls in your business are reaching the correct person, then you have to ensure a high-quality communication channel for your company. Grandstream Dubai will surely provide the telephone system that your business needed and equipped with the advanced and up to date technical features. It is very essential that you select a high quality and professional Telecom company for setting up your PABX system in Dubai. We are surely the pro in this matter. With our experience and expertise, we have served hundreds of customers in UAE. Thus, our performance assures our caliber and quality. We are not limited to Dubai, you will also find our solutions in many major cities of U.A.E.